Image courtesy of Catboxx (http://catboxx.blogspot.com/2010/05/parchman-farm.html). 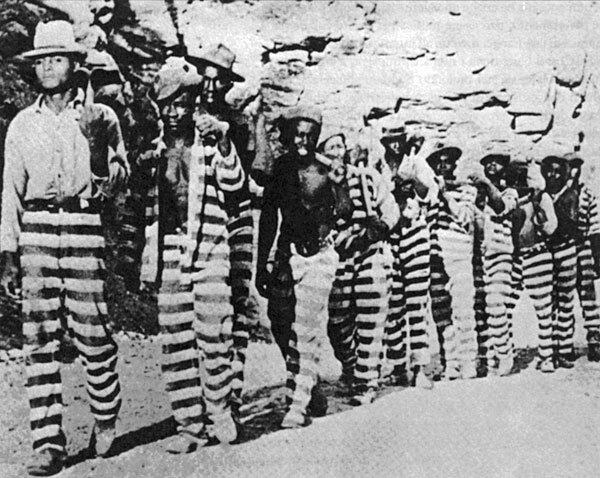 One of my favorite images of the old Parchman Farm chain gang. The other day, I posted the DOJ report on prison populations as of Mid-year 2011. I did so, in an effort to respond to a question I was asked by a reader. Quite simply, how many Deaf inmates are there, in American prisons. In numerous searches, including having read the above report, I have not yet been able to find a reliable answer to that question. One answer bothered me, however. On Yahoo answers, one respondent claimed that Deaf inmates are not sent to conventional prisons, but rather to special halfway houses or dorm facilities. Needless to say, anyone who reads DeafInPrison.com knows this is – sadly – just not true. This is an article I found on About.com. Deaf Prisoners – When Deaf People Are in Prison. Posted in Uncategorized.Tagged Chain Gang, Deaf, Deaf in Prison, DOJ, Hearing Impaired, Joe Arpaio, Justice system, Parchman Farm, Prison. Since 1/3 of individuals are HoH by age 65 and by 75 1/2 of folks are HoH or Late Deafened I’d say the rate of hearing impairment in prison is going to be at least at the national average. There are all sorts of aging inmate population studies. The more Iook into this (as a retired social worker and HoH/signing newbie lawyer) the more concerned I am about various issues including the problems of the Deaf who are “educationally retarded” (using the old term) and cannot understand, under the best of situations, what is going on regarding legalities. I’m not saying Deaf people don’t commit crimes or that they don’t (in some cases) need to be out of the general population, but if, in fact, the pre-lingually deaf were not brought up in a home that nutured their needs and they developed what I keep hear slung around as “Primitive Personality Disorder” then these folks need to be in a mental health facility with rehabilitative services, not to mention being given basic education and signing classes. Yes, we agree. Thank you for the wonderful comment. We hope that in some small way, this site may be of help to you and your son. Damn straight! It’s not true! My former classmate, she’s deaf too. Got murdered in prison!